The Yamatogawa Bridge is a three span continuous steel cable-stayed bridge that carries the Wangan Expressway across the Yamato River in Osaka. It is located about 5 km south of yesterday's Minato Bridge. It was built for the Hanshin Expressway Public Corporation in 1982 at a cost of 13.9 billion yen. It crosses the Yamato River at a very high skew and so it required a long main span of 355 m (1166 ft). 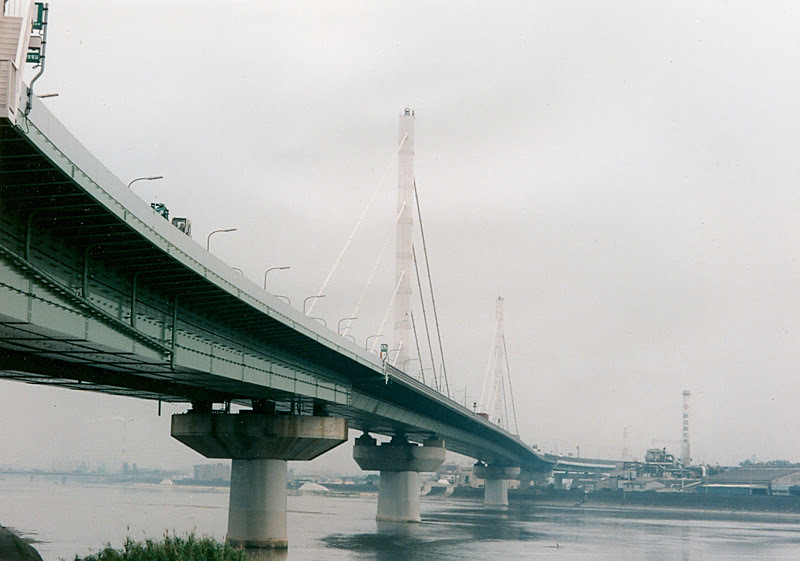 The Yamatogawa is an unusual looking cable-stayed bridge. The single pylon towers are not attached to the substructure and they support a single plane of only four cables. The steel box girders sit on hammerhead bent caps supported on steel pipe piles. The bridge carries two lanes of traffic in each direction. Osaka Bay Bridges: Yamatogawa Bridge by Mark Yashinsky is licensed under a Creative Commons Attribution-NonCommercial-ShareAlike 3.0 United States License.